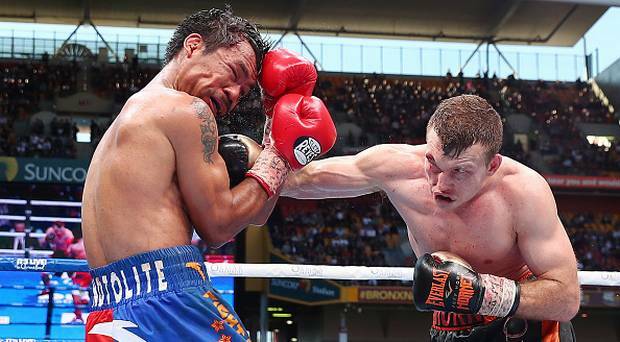 British welterweight ace Gary Corcoran’s world title bid against Manny Pacquiao conqueror Jeff Horn will be shown exclusively live on BoxNation next month. The 27-year-old will face the unbeaten Australian at the Brisbane Convention Centre on December 13th as he looks to cause an upset in Horn’s hometown by capturing his WBO welterweight world title. 29-year-old Horn shocked the boxing world with his impressive display against the legendary Pacman this summer when his come-forward and all-action approach caught the judges’ eyes as he went onto win the world title belt via a unanimous decision. 51,000 fans crammed into Brisbane’s Suncorp Stadium to cheer on the 12-to-1 underdog that day and were not left disappointed when the former high school PE teacher and 2012 Olympian dethroned the Filipino. However, this time around he will have the odds in his favour as he returns home for his first defence against Top-10 contender Corcoran. Nicknamed ‘Hellraiser’ the Londoner has won 17 of his 18 professional fights with just one loss – that coming against Welsh star Liam Williams. He has bounced back well from that 11th round knockout defeat in July of last year by winning his last two fights, including a split decision victory over Larry Ekundayo in which he captured the vacant WBO Inter-Continental welterweight title. The winner of Horn-Corcoran will be obligated to make his next defence against newly installed mandatory challenger and former light-welterweight unified champion Terence Crawford. The American is one of the sport’s best pound-for-pound fighters and the chance to share the ring with him will be extra motivation for both men as they look to deliver fight fans an early Christmas present exclusively live on ‘The Channel of Champions’.